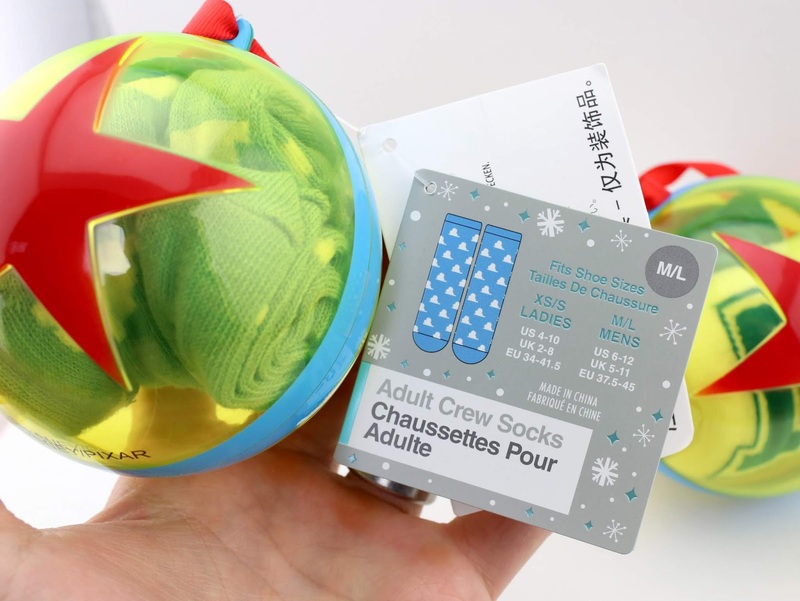 Just this past holiday season, the Disney Store (and ShopDisney.com) released an excellent series of six Pixar inspired adult crew socks—all brilliantly packaged in Luxo ball ornaments! These were on every Pixar fan's "must have" list for Christmas, I'm sure, and made for perfect stocking stuffers (which is exactly how I got mine). 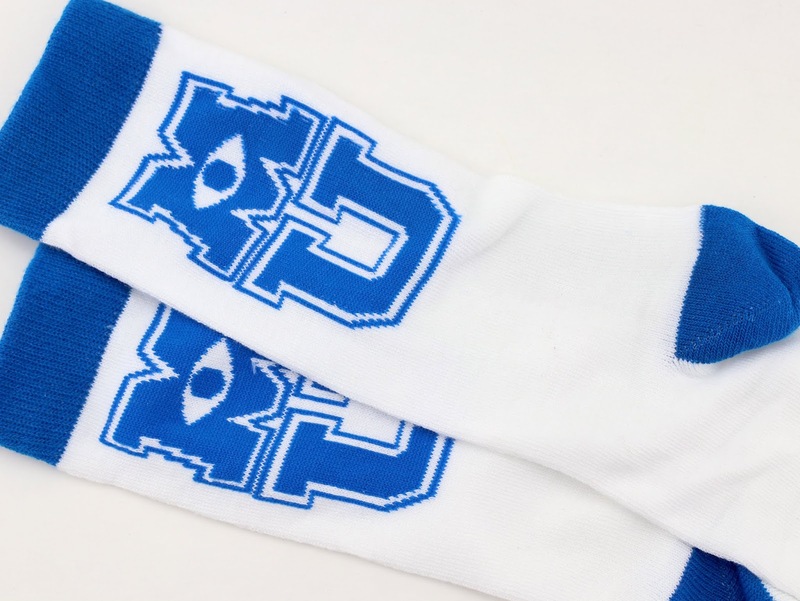 The two pairs I decided to go for are the ones I felt were the more masculine (or neutral) designs: The Toy Story cloud pair (based on Andy's iconic wall pattern) and the Monsters University "MU" pair (which totally captures the college/letterman feel). The other four designs that were released were based on Coco, Up, The Incredibles (specifically Edna) and Inside Out (see them all HERE). 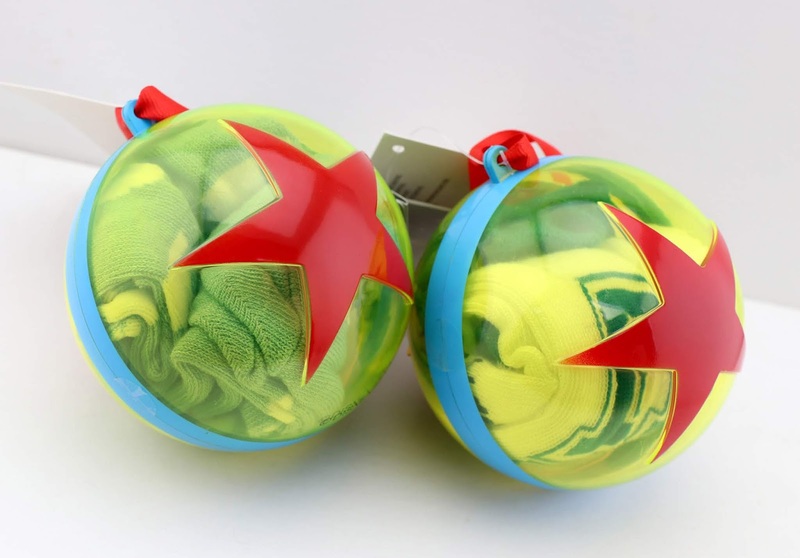 Each Pixar ball ornament is clear plastic with a satin ribbon for hanging. They open easily in half to remove the socks and snap right back together. Original retail was $9.95, but they did eventually go on sale as well. Check out ones I got in more detail! 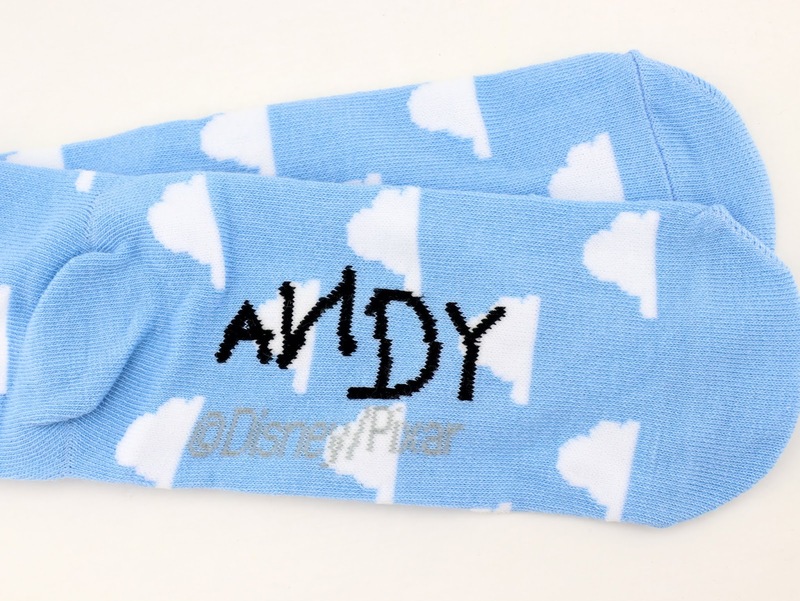 A fun surprise (what they don't tell you on the tag) is that one of the Toy Story cloud socks has "Andy" written on the bottom in his signature way (like how it's written on the bottom of Woody's boot). This was such a perfect touch! I tried both pairs on and they're soft, comfortable and stylish (well, as far as Disney/Pixar style goes). Love them! I believe these are the first pairs of Pixar inspired socks I've ever had, so that's pretty neat. I'm definitely glad I went for them and I'm excited to wear them with my Pixar outfits to complete my ensembles. These have since sold out online, but you may still be able to find them at your local Disney Store. If you missed these originally and want to add them to your collection, be sure to check out THIS DIRECT LINK to current eBay listings (there are a few up as of right now). Highly recommend! Did you pick any of these up? Which design is your favorite? Let me know your thoughts down below.